There are 3 bald eagles in the chase. The lowest bald eagle is a 3-year-old and it caught the fish that is dangling from one talon. The adult bald eagle was right behind the 3-year-old when the youngster caught the fish and immediately the chase was on. The best way for the catcher to hold onto his fish was to make it deep into the woods and land on a branch, fish again the branch. 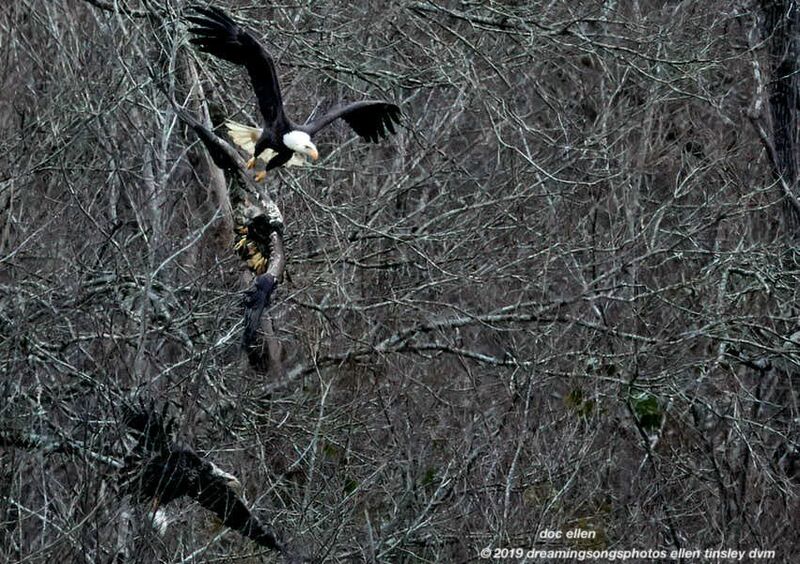 The 3-year old had almost made it to safety when a 2-year-old eagle joined the chase and cut in below the adult. The chase was fast and furious with a lot of screams. Ultimately, the 3-year-old lost the game and dropped the fish. I have enclosed both a full-color and a black and white image. The scene is so detailed that it may be easier to see the 3 eagles in one or the other photographs. Posted in birds, black and white photography, Eagles of Jordan Lake, Haw River, Jordan Lake, Jordan Lake State Park, photography, raptors, wild birds and tagged as American bald eagle, bald eagle, bald eagle flight, bald eagles of Jordan Lake, eagle, eagles of Jordan Lake, flight, Haw River, immature bald eagle, immature eagle, Jordan Lake, Jordan Lake State Park, raptor.